Join us for our annual Membership Spring Fling Celebration. WHEN: Saturday, March 30 from 7 to 9 PM. WHERE: Cafe Gecko, 1381 W. Campbell Rd. Located on the SW corner of Coit and Campbell. We are very excited to host this year's event at Cafe Gecko, a restaurant owned and operated by a PEHA member. You can find full details about the event by clicking the Calendar link in the right column. Social Events like this are one of the benefits of membership. It's not too late to join! Your block representative will be distributing a flyer and membership form this week. Bring it with your dues payment to the event. We'd love to see you there. We kicked off our 2019 Membership Drive on February 1. And in just 3 short weeks, through 2/25/2109, 122 of the 527 homes in our neighborhood have joined PEHA! Is it too Texan to say “Yee Haw and Thanks” to each of you? We are truly grateful for your early support. For the first time, this year we held a Membership Open House this past weekend. We were encouraged by the response with 10 neighbors stopping in to complete registration and pay the $60 annual dues. We even welcomed a young family who won’t be moving into their home until April. And they joined! As we begin our March Membership Madness, we are at the 23% membership level, aiming for 100%. 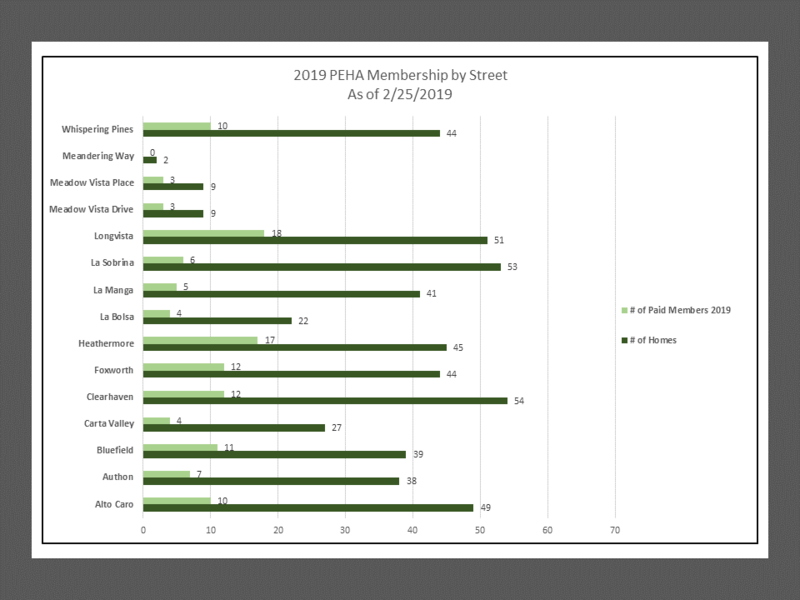 This graph shows membership levels by street through 2/25/19. If you haven’t yet joined, your block representative is reaching out with a membership form and reminder of why Prestonwood East Homeowners Association needs your support. We are also planning our annual Spring Fling Membership Celebration on Saturday, March 30. Our Association’s purpose is to build an attractive community through ongoing beautification projects, secure our community through VIP patrol, build a stronger community through frequent communication, periodic social gatherings, and encourage member engagement through a variety of volunteer opportunities, both large and small. We can accomplish these goals only with your membership support and active participation in PEHA. Won’t you join us now?